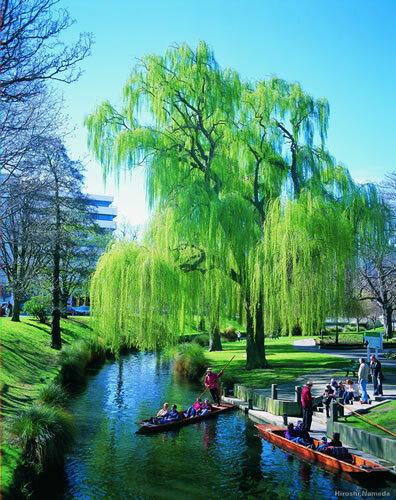 Christchurch, on New Zealand’s South Island, a three-hour from Sydney, Australia, is the most English city outside of England. And, like England, people go punting on the tree-lined Avon River. The city is renowned its gardens and a free trolley makes getting to the parks and museums fun and easy. Rent a car. In New Zealand, driving is on the left but there is very little traffic and the roads are good, plus the motels are reasonable. It is the only way to see and enjoy the island. Driving west from Christchurch the towns and rolling hills are expected, but then the unexpected happens. The road begins to climb until it clears a mountain pass to present a stunning scene - snow-capped mountains against solid blue skies. A scene straight out of “Lord of the Rings.” The always-changing scenery of the South Island dazzles even the most jaded tourist with its variety: snow-capped mountains, blue lakes, teal-colored rivers, waterfalls, rainforests, rugged coastline, beaches, and glaciers. Just when you think there is nothing more to impress you, you round a corner or come to the top of a rise in the road, and once again you are amazed at the beauty of the South Island. 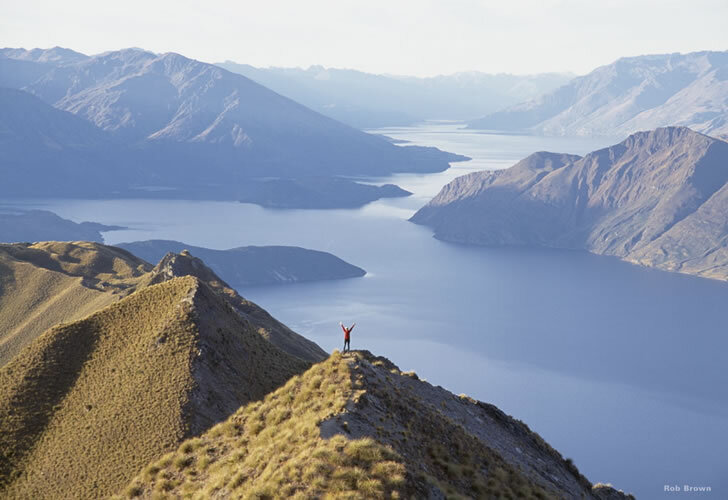 New Zealand and extreme adventures are synonymous. The adventures are many and varied. For a thrilling bird’s-eye view consider paragliding over mirror-like Lake Wanaka with the snow-capped Southern Alps as a backdrop. 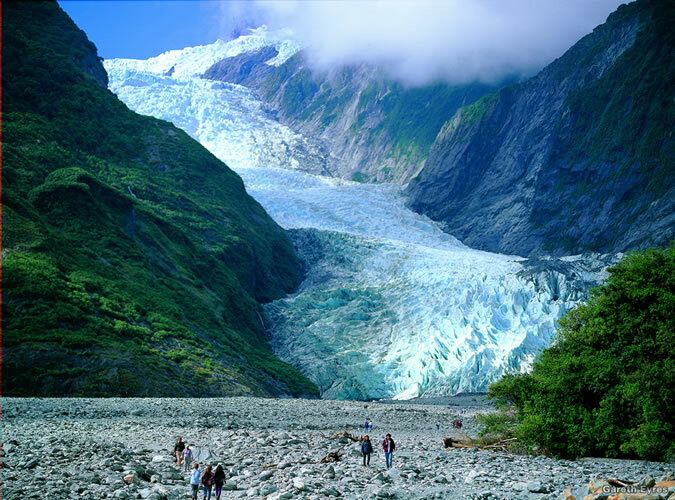 After a hike on the rainforest path to the Franz Joseph Glacier viewing point, you may find you need a closer look. For those who are not into arduous hiking, a helicopter to the top of the glacier is the perfect answer. Walking on the ice field feels like being top of the world. Returning the copter swoops down for a closer look at the glacier’s surface, which is fractured into pinnacles creating what looks like a city of skyscrapers. The West Coastal Road is one of breath-taking scenery at every turn. Take your time. Plan to stop at the uniquely layered Pancake Rocks and check out the seal colony at Cape Foulwind. After exploring the South Island head to the North Island. New Zealand is very tourist friendly. They have it all figured out. Just drop the rental car at the dock in Picton, take the modern ferry to Wellington, and a rental car will be waiting. It is all part of the service. 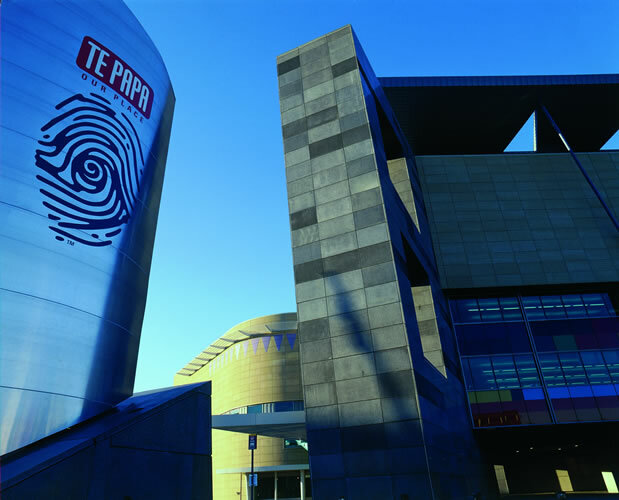 In Wellington, don’t miss the Te Papa Museum highlighting the history of the islands. 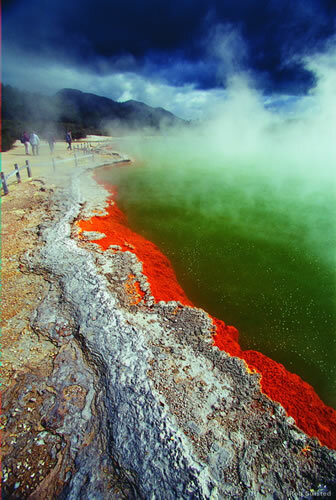 The central part of the North Island is a “hot-bed” of thermal activity, there are steam-spewing fumaroles. At Wai-O-Tau near Rotorua, wandered around a thermal wonderland of collapsed volcanic craters, boiling mud pools, steaming lakes, and fumaroles. Adding to the unworldly look are the hues of red, yellow, orange and purple edging some of the formations, caused by the presence of sulfur, antimony, iron oxide and other elements. It is a bit unnerving to hear the earth gurgle and bubble so near the walkways. Geothermal energy is harnessed to provide five percent of New Zealand’s electricity. 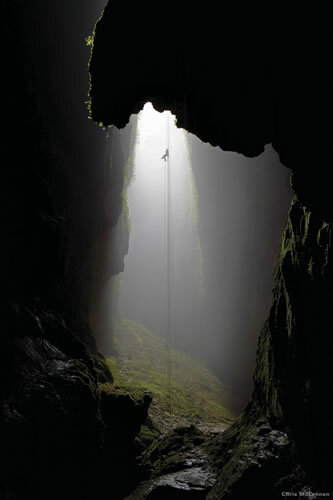 Don’t miss the Waitomo Cave, which at first seems like a typical cave with the usual stalactites and stalagmites. Then visitors board a boat on the underground river - in the dark. And above is a vast Milky Way of blue-green lights from the thousands of glowworms. The glowworm, really a fly larva, produces the light to attract a dinner of insects in its sticky web. Nearby is the do-not-miss Woodlyn Park farm with its “show-stopper” one-man Pioneer Show that relates the history of New Zealand’s settlers with a mix of humor, audience participation, and farm animals that perform on cue. The back of the stage is open to the hilly pasture, where the “header” chases the sheep down the pasture onto the stage. Someone from the audience volunteers to help shear one of the sheep the old fashioned way with a hand-cranked clippers. The farm also has unique accommodations - an airplane remodeled into a modern two-room “motel” with kitchenette. Airplane buffs can choose the bed directly behind the cockpit, watch a spectacular sunset, before dozing off. 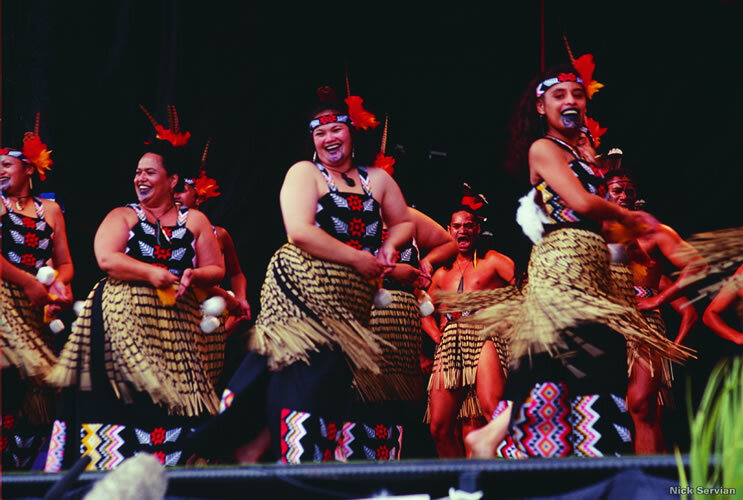 The Maori, the pre-European settlers of New Zealand, celebrate their culture with a show followed by a hangi. At the entrance of the Maori ancestral house the tattooed-faced warriors, after a series of challenges, determine if the dinner guests are friendly. If so, they are invited to enter. There are speeches of welcome and the traditional Maori greeting - hongi - a handshake followed by touching noses. The performance of traditional songs and dances is followed by a hangi – a feast steamed over red-hot rocks for three hours. After dinner each foreign national group was asked to sing one of their national songs. The Kiwi expression, “Too right,” describes beautiful, tourist-friendly New Zealand where the sights are astounding and the activities varied.